One of my favorite things to do is try new pasta recipes. Why? Because pasta recipes are usually easy to follow and my family loves and I mean LOVES pasta. Lately Pinterest has been my go to for all my pasta needs. From lasagna soup to my families new favorite Spinach & Sausage Stuffed Shells, you can never go wrong. 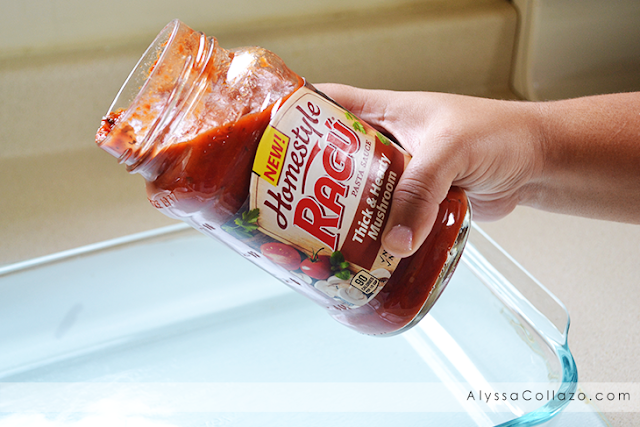 But my recipe wouldn't be complete without using RAGÚ and can I just tell you, their new line RAGÚ Homestyle is delicious. Its thick and hearty texture hugs every noodle, and provides a delicious made-from-scratch taste! This recipe is so easy to follow and I'm so excited to share it with you. I used RAGÚ Thick & Hearty Mushroom. This sauce paired perfectly with my Spinach & Sausage Stuffed Shells. I especially love how thick the sauce is, my stuffed shells sat perfectly on top of this hearty sauce and boy did it make a difference. 1 tsp of Oregano, Dried. Preheat oven to 350 degrees. In a skillet over medium heat, brown and crumble the sausage. Drain any excess fat and remove from heat. In the same saucepan, cook spinach until wilted or about 1-2 minutes. Cook your Jumbo Pasta shells according to package. In a mixing bowl, combine the Ricotta, 4ozs of Mozzarella, 1/2 cup of Parmesan, Egg, Oregano, and Garlic Powder. Stir in the Spinach. 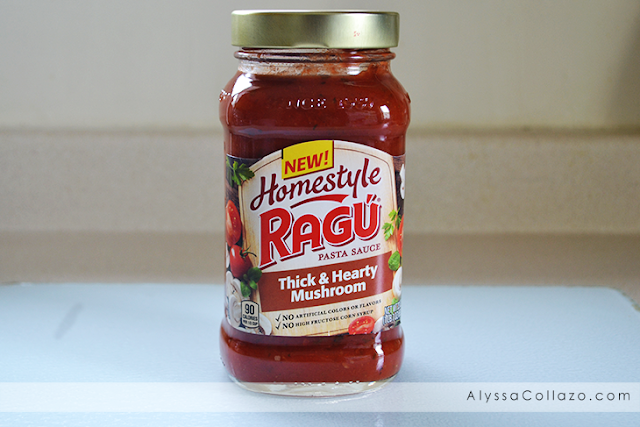 Coat the bottom of a baking dish with the entire jar of RAGÚ Thick & Hearty Mushroom sauce. Spoon the cheese mixture into the shells and place shells open side up. Sprinkle the sausage over the top of the shells. Then sprinkle with the remaining 4oz of Mozzarella. Cover with aluminum foil and bake at 350 degrees for 30 minutes or until the cheese is bubbly. If you like a cheesy crust, you may broil it uncovered for 3-5 minutes (watch closely). Let stand 10 minutes before serving. Pretty easy right? You may look at the ingredient list and think OMG, but this is stuff I usually keep in my cabinets and fridge. Plus, with this recipe you can add more veggies like broccoli or even make it with chicken. 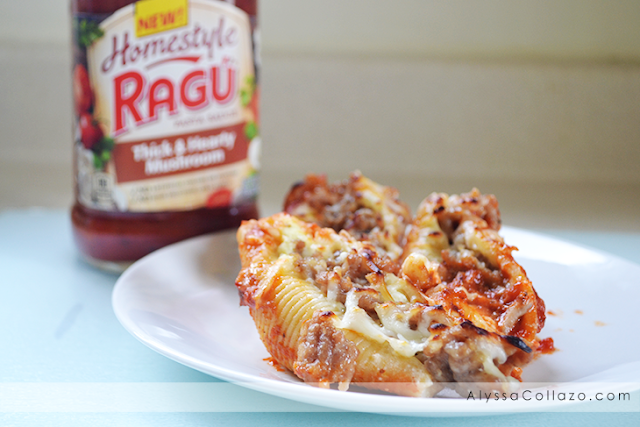 As long as you have RAGÚ Homestyle you're good to go! Be sure to check out RAGÚ for more delicious recipes. Those look so good! I love making Italian dishes with Ragu Homestyle. I like a substantial sauce. I absolutely love all recipes that include Ragu products. They just always make them so much better! Ragu products are so great! This recipe should be delicious. Those look really good. I haven' made stuffed shells in such a long time. I'll have to give your recipe a try. I'm sure they taste great. Ragu is a favorite here. I love using it on all my pasta dishes. This looks yum! I want to try this in pasta. It looks so delicious! I can't wait to try it! We love pasta! I haven't even made stuffed shells before. It looks pretty easy though. I might have to try this recipe. I couldn't add the spinach though. My family wouldn't eat it. This is such a yummy meal with the weather taking a turn for the chilly soon. Yummy! This looks super tasty, I am sure my husband would enjoy this. I would love to try making this over the weekend. 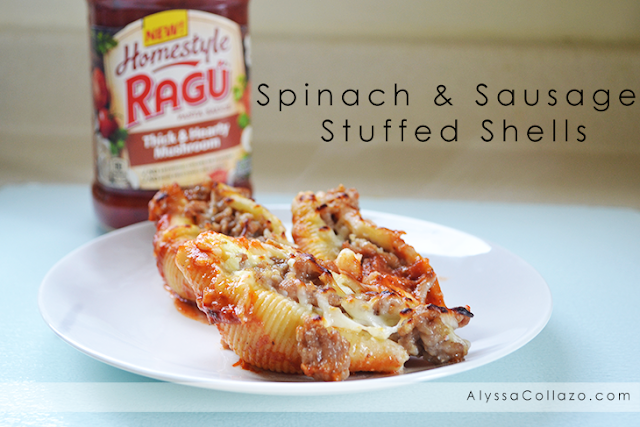 Great idea, almost like a mini lasagna with spinach and sausage. Ok, so I guess it isn't a mini lasagna at all, but it still looks amazing. RAGU has always been our choice when it comes to pasta sauce. Can't wait to try your recipe. Looks delish! RAGU is my #1 choice for jarred pasta sauce. We especially like the Homestyle Thick and Hearty Traditional and the Homestyle Thick and Hearty Four Cheese. This looks yummy! I've never made Stuffed Shells before. This recipe looks delicious. I love Ravi! This recipe looks so delicious and easy to make. I will have to pick up the ingredients I need to make this for dinner this week. have to admit i'm not a fan of spinach. popeye not withstanding lol but this recipe looks amazing! 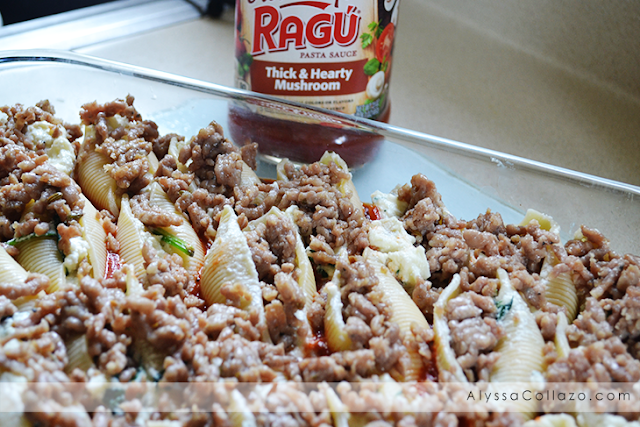 I have always been a huge Ragu fan and these look amazing! Wow, that one looks delicious. I love ragu sauces, they are really yummy! This looks really good and easy to prepare. My kids love pasta so I'll give your recipe a try. These stuffed shells look so yummy! I normally use ground beef but sausage sounds delicious. I need to try it! Great recipe! My hubby loves stuffed shells! So making these for him! I've been working on a rotating menu plan that doesn't keep us eating the same ol' meals week after week. This recipe will put a smile on my hubby's face. Omg these shells look absolutely delious!!! Must give your recipe a try! Shells are my fave. The whole family lovest hem when I serve them too. This looks like the kind of comfort food that reminds you of your childhood! I think it's an awesome recipe and it's perfect for the season! YUM! This looks delicious. Spinach and sausage sounds like a great combo. OMG YES! I haven't had stuffed shells in so many years! Your recipe is giving me ideas!